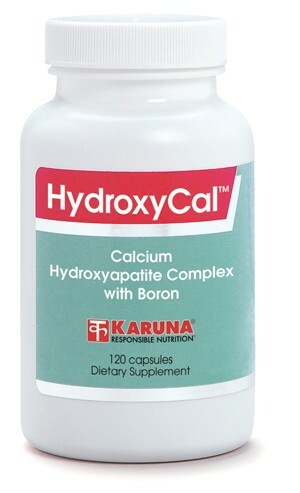 HydroxyCal supplies an efficient complex of nutrients and cofactors that support bone strength and maintenance. Calcium is supplied as citrate as well as in a freeze-dried, whole-bone bovine extract. This extract is also a rich source of bone matrix proteoglycans and trace minerals, and has been shown to be exceptional for supporting bone maintenance and repair. A generous amount of vitamin K is included, far more than in most other bone support products, and vitamin D is supplied in the preferred D3 form for maximum bioavailability. 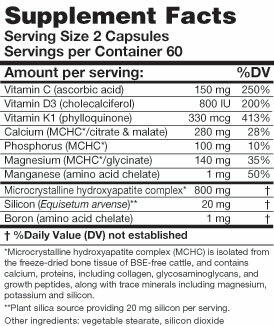 These nutrients, along with vitamin C and manganese, work together to support optimal bone density and help skeletal structures maintain their integrity during minor traumas. HydroxyCal contains microcrystalline hydroxyapatite complex from whole bone, which has been shown to support bone remineralization (Am J Clin Nutr 1982;36:426-30) and optimum skeletal repair processes (Manitoba Med Rev 1965;45:92-6). Suggested use for adults: Two capsules, three times daily with meals, or as directed.